The Water Discus Underwater Hotel has been designed by Polish company Deep Ocean Technology (DOT), It is being planned for Dubai. Water Discus Hotels comprise two discs ( an underwater and above-water one). The two parts of the structure are connected by three solid legs and a vertical shaft containing a lift and stairway. 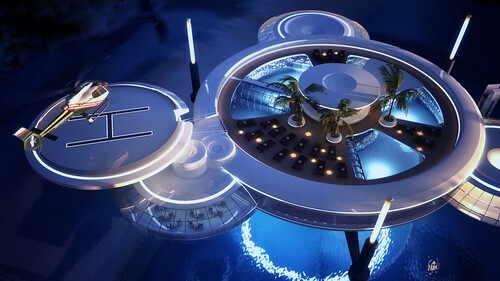 The underwater hotel is designed to integrate the submarine activities with waterside living. The concept of the Water Discus hotel was conceived by the Polish firm Deep Ocean Technology (DOT) in collaboration with researchers from the Gdansk University of Technology. DOT is also developing autonomous unmanned submersibles to serve the hotel’s guests. BIG InvestConsult is the representative for DOT and holds the technology marketing rights in the GCC countries. In May 2012, Dubai World’s ship building subsidiary, Drydocks World, signed an agreement with BIG to build the first Water Discus hotel in Dubai. The project is currently in the implementation phase. Its construction timelines and budget, however, have been kept secret and are undisclosed. Each hotel will have 21 bedrooms with underwater views in the lower disc and the underwater element is closely connected to its marine environment through a diving platform, the bathrooms have a underwater feeling as it is all glass on the sides so you feel you are part of the ocean, the water is clear and beautiful, furniture has a contemporary feeling including Vanity Units with Stone Tops to give the clean and classy style. Large windows of the rooms facing the waters will offer views of underwater world, coral reefs, flora, fauna and sea animals of the Persian Gulf. Room exteriors will have special lighting for macro photography and an external explorer robot to enable the guests to interact with the marine life. This entry was posted in Architecture, Construction and tagged Discus Hotel, Discus Underwater Hotel, Water Discus Hotel, Water Discus Hotel in Dubai. Bookmark the permalink.